Although there are other earlier examples of computer games, most consider the first true computer game or digital game to be “Spacewar!”. This game was first played and programmed by Steve Russell and first released in February 1962. The game ran on the DEC PDP-1 computer, and consisted of two spaceships that maneuvered around a star that pulled at the ships with its gravity. 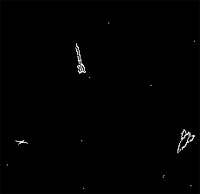 The objective of the game was to avoid colliding with the star while trying to shoot the other ship with missiles. The player controlled the game using control switches or a control box. They had the ability to rotate the ship clockwise or counterclockwise, provide the ship with thrust, fire missiles, and go into hyperspace.